The Misa a Buenos Aires was composed in 1996. It combines elements of mass and Argentinian tango in its writing as well as through the mixture of voice and dance orchestra. A mass loved by modern audiences will be performed at the Choralies in the presence of its composer. Argentinian music teacher and choral conductor Virgina Bono trained with renowned conductors during masterclasses and workshops. 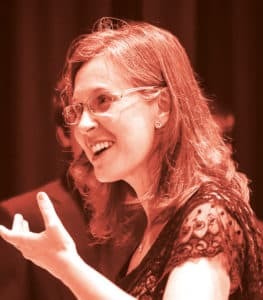 She won the Conductor of Honor Merit award in 2000 at the Argentinian Association for Choral Music (AAMCANT) in La Plata, and the 3rd prize at the International competition for choral conductors in Bologna (Italy) in 2003. She has won several other prizes in international competitions with her choirs and is regularly invited as guest conductor and member of the jury in various festivals.